In some pictures, Shiva is depicted as wearing a garland made of skulls. This necklace is referred as Mund Mala. 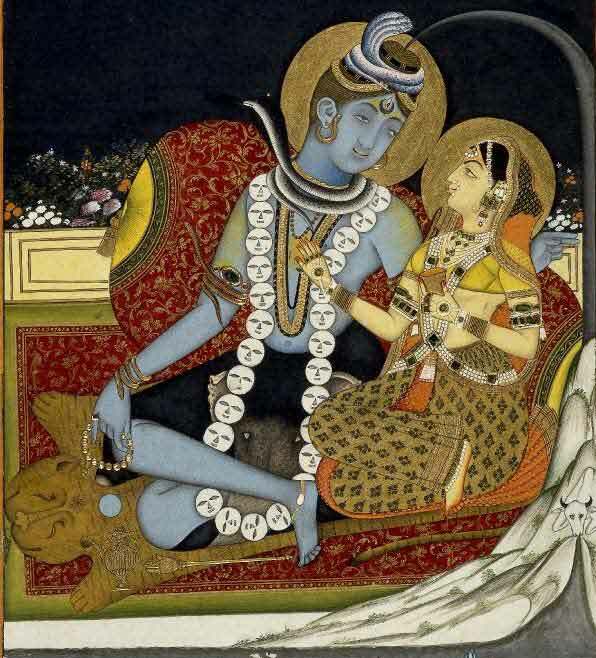 The story of the skull garland was narrated by Shiva to Goddess Sati. Sage Narada was eager to know about the secret of mund mala. Therefore, he incited Goddess Sati to find out the secret. When Mata Sati kept asking about the Mund Mala, Shiva revealed the secret. Shiva told Mata Sati that the skulls in the garland are hers. There are 107 skulls and therefore Mother Goddess had appeared 107 times. Mata Sati then wanted to know why she has several births and Shiva has only one birth. Shiva then told Sati that he knew the secret of immortality. Sati then wanted to hear the secret of immortality. Shiva started narrating it but fell asleep in between and the secret was never revealed. Mata Sati then self-immolated at the Daksha Yajna. Thus, she became the 108th skull in the garland. Later Mother Goddess Sati appeared as Maa Parvati. But she listened to the story of immortality in the Amarnath Cave. Thus Mund Mala of Shiva has 108 skulls. All the skulls are of the previous birth of Mother Goddess Shakti.